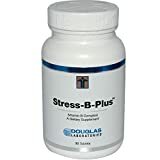 Stress-B-Plus Vitamin B Complex (90 Tablets) – Douglas Laboratories Stress-B-PlusTM is a comprehensive B supplement providing all of the essential B vitamins as well as related nutrients. *Daily Value not established. Keep out of reach of children. For optimal storage conditions store in a cool, dry place. This entry was posted in Buy Supplements and tagged Douglas, Laboratories, StressBPlus, Supplement by TOSMS. Bookmark the permalink.